Karl working outside Iron-Breaker Mine. 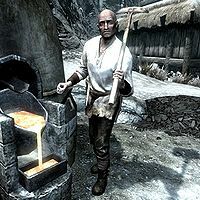 Karl is a Nord miner working in and around Iron-Breaker Mine in Dawnstar. The owner of the mine, Beitild, suspects he drinks on the job and she is indeed correct. He never sleeps and spends his entire night inside the mine either mining, eating or drinking and keeps going until sunrise. At 8am he heads outside and finds the nearby smelter where he works twelve solid hours, under the watchful eye of his employer. As soon as the clock strikes 8pm, Karl takes off at a running pace towards Windpeak Inn, where he spends the entire evening downing beverages and dancing on the porch. As a miner, he owns a pickaxe which will be his weapon if attacked. He only carries some lower-class items. He wears a set of miner's clothes and cheap boots. Before the Waking Nightmare quest, the entire population of Dawnstar shares the same nightmare and Karl is no exception: "Can't sleep well no matter how much drink I put in me." He will also readily admit his heavy drinking and how little he cares about Beitild, saying, "I'm no one special, just a miner who swings a pickaxe for his drinking money." and "Beitild thinks I drink on the job. Well, what does it matter if I do? Huh?" Beitild: "Work hard, now! The pride of Iron-Breaker Mine is on the line." Karl: "Pride of the what? This isn't the Legion, boss. We're miners, not soldiers." Beitild: "You'll shut your mouth and get back to work, or you won't be a miner or a soldier by the day's end. Hear me?" Beitild: "Keep at it. We need to work twice as hard now that fat-headed Leigelf has declared war!" Karl: "We're at war with Leigelf? Isn't he your husband?" Beitild: "No he isn't! He's the enemy, and we are going to crush him." Karl: "Drafted into a war, how could my life get worse?"